Our goal is to help you get the most amount of money for your home in the shortest amount of time with the least amount of inconvenience to you. This can be done by pricing your home competitively, marketing your property effectively, and by preparing and showing your property correctly. The single most important factor in getting the best price and selling your home quickly is pricing it competitively. If you price it too high, it will sit on the market for so long that when a buyer does make an offer, it will likely be far below the asking price. If you price it too low, you may sell it for less than what it is worth potentially costing you thousands of dollars. In order to price your property competitively, you need to look at competing homes (active listings) homes that have sold (comparable sales) and homes that didn't sell because they were over-priced (expired listings). The best way to evaluate the market is with a CMA "Comparative Market Analysis" prepared by a real estate professional. This report will help you evaluate the market conditions and determine the price range that your home is most likely to sell. We make your move easier. All of our clients are offered to use our enclosed moving trailer at no expense to help make your move. There are a limited number of people looking for homes like yours in your area at any given point in time. The best way to ensure that you sell your home quickly and get the best price is to make sure the maximum number of interested buyers have available information on your home. While putting up a For Sale sign and creating a good flyer/brochure are a must, the majority of buyers will find out about your property either from a full time Realtor, through the MLS, or from a real estate Internet web-site. While running classified ads and/or print ads are still effective, they are quickly becoming a thing of the past. Over 70% of all home buyers start their search for homes on the Internet, so it is important that your home is listed on all of the major Internet sites. In order to maximize your exposure and reach as many ready, willing, and able buyers you must list your home on the local MLS (Multiple Listing Service). 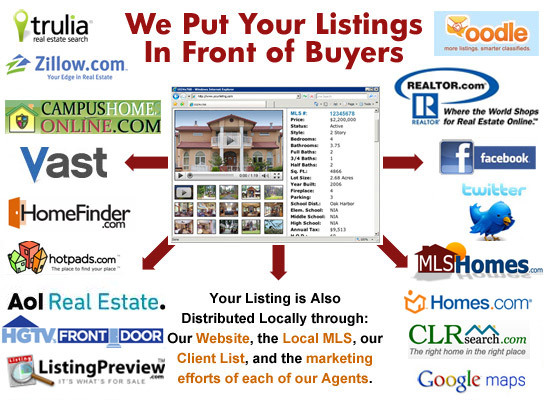 By doing this, you not only expose your property to the potential buyers of every real estate agent that participates in the MLS, but you get important "Listing Syndication" to Internet sites such as: Realtor.com, Homes.com, HomeSeekers.com, MLSHomes.com, Trulia, Zillow, etc. By listing your home on the MLS, your home will also be searchable on MLS participants MLS "IDX websites" (like this one) to thousands of potential buyers world wide. Never underestimate the power of a good "sales person". In today's market, you need a real estate agent that knows your home and can help potential buyers see how it fits their price range and needs. Most out of town buyers will work with a Realtor, and when your home is promoted to the other Realtors in the MLS, it is much more likely to sell than if you try it alone. Hometown offers more relationships to its buyers. Our office is staffed with two supervising brokers. This means that if you want to be represented as a buyer but our office also has the listing, we can ensure that your interest as a buyer is represented correctly.